Sign up for a GoBank Checking Account in minutes! No overdraft fees, penalty fees or ongoing minimum balance requirements, ever! Pay bills and quickly send money to friends and family. Deposit checks using mobile check deposit & paper checks available. Deposit cash for free exclusively at any participating Walmart® register in the U.S. Deposit cash for up to $4.95 at participating locations nationwide like 7-Eleven®, CVS/pharmacy®, and more. 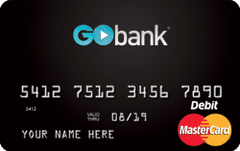 Click Apply Now for more info about GoBank's simple fees.